33. The discipline of the school shall be maintained by the personal influence of the Headmaster and staff and shall be promoted by a system of rewards and privileges. (i) Forfeiture of rewards or privileges (including pocket money) or temporary loss of recreation. (ii) Alteration of meals for a period not exceeding three days: provided that any such alteration shall be within the limits of a special dietary scale approved by the Chief Inspector. (a) No boys under the age of twelve shall be kept in separation. (b) The room used for the purpose shall be light and airy and kept lighted after dark. (c) Some form of occupation shall be given. (d) Means of communication with a member of the staff shall be provided. (e) If the separation is to be continued for more than 24 hours the written consent of one of the Managers shall be obtained and the circumstances shall be reported immediately to the Chief Inspector. (iv) Corporal Punishment. Every effort shall be made to enforce discipline without resort to corporal punishment. Where it is found necessary its application shall be in strict accordance with Rule 35 or 36 as the case may be. (a) It shall be inflicted only with a cane or tawse of a type approved by the Secretary of State. (b) If applied on the hands, the cane shall be used and the number of strokes shall not exceed three on each hand, but no boy over 15 shall be so punished. (c) If applied on the posterior with a cane or tawse, it shall be applied over the boy's ordinary cloth trousers and the number of strokes shall not exceed six for boys under 15 or eight for boys of 15 and over: provided that in exceptional cases, with the special approval of one of the Managers, twelve strokes may be administered to boys of 15 and over. (d) No boy with any physical or mental disability shall be so punished without the sanction of the Medical Officer. (e) No corporal punishment shall be inflicted except by the Headmaster (or during his absence by the officer appointed under Rule 21 to exercise the duties of the Headmaster) or by an officer of the school in his presence and under his direction. (f) It shall not be inflicted in the presence of other boys. (g) Notwithstanding the provisions of paragraphs (e) and (f) of this Rule, for minor offences committed in the schoolroom by boys under 15, the principal teacher may be authorised by the Managers to administer with the cane not more than two strokes on each hand. Where the principal teacher is so authorised by the Managers to administer corporal punishment, he shall keep a book to be known as the Schoolroom Punishment Book and he shall at once enter therein any corporal punishment inflicted by him under this paragraph. (a) It shall be inflicted only on the hands with a cane of a type approved by the Secretary of State and shall not exceed three strokes on each hand, but only girls under 15 shall be so punished. (b) No girl with any physical or mental disability shall be so punished without the sanction of the Medical Officer. (c) It shall only be inflicted by the Headmistress (or during her absence by the officer appointed under Rule 21 to exercise the duties of Headmistress) or by an officer of the school in her presence and under her direction. (d) It shall not be inflicted in the presence of other girls. 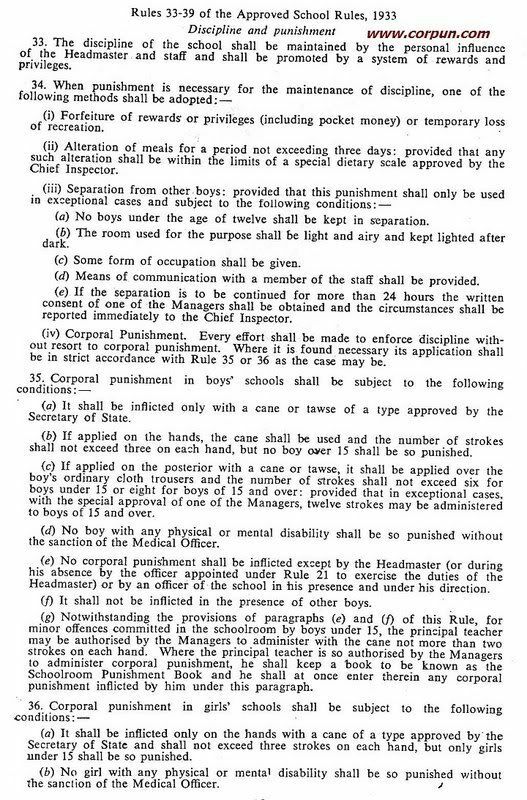 (e) Notwithstanding the provisions of paragraphs (c) and (d) of this Rule, for minor offences committed in the schoolroom by girls under 15, the principal teacher may be authorised by the Managers to administer with the cane not more than two strokes on each hand. Where the principal teacher is so authorised by the Managers to administer corporal punishment, she shall keep a book to be known as the Schoolroom Punishment Book and she shall at once enter therein any corporal punishment inflicted by her under this paragraph. 37. The Headmaster shall be responsible for the immediate recording of all corporal and other serious punishment in the Punishment Book which he is required to keep under Rule 18, except corporal punishment inflicted by the principal teacher under Rule 35 (g) or 36 (e) as the case may be, and he shall enter therein such details as may be required by the Chief Inspector. The Headmaster shall examine the Schoolroom Punishment Book, if any, at least once a week and shall sign it. The Punishment Book (and the Schoolroom Punishment Book, if any) shall be examined at each meeting of the Managers and shall be signed by the Chairman. They shall also be shown to the Medical Officer at least once a quarter. 38. Except as provided by these Rules no member of the staff shall inflict any kind of corporal punishment. The term "corporal punishment" includes striking, cuffing, shaking or any other form of physical violence. Any person who commits a breach of this rule shall render himself liable to instant dismissal. 39. No boy shall be allowed to administer any form of punishment to any other boy.